This is the third post in the TIIS-Matrix series. The first is found here and the second one here. We’ve looked at the TIIS-Matrix’s main ideas regarding Telling/Involving and Instructor driven vs Student driven learning (training) activities as well as gone and placed these activities in the matrix to get a feeling of the differences between the four quadrants. What’s next to do is to look at each and every of these activities and think about what would happen if this particular activity were to improve. Where would it go inside the matrix? And the opposite, if an activity was as bad as it could get. Where would that activity go? Which new location in the matrix would it be placed at? Let’s take a look at the activity of Workshops. I placed it in the II-quadrant (Instructor-driven / Involving) since it’s usually run by an instructor or manager and the activity is highly involving if done properly. Now imagine the ultimate workshop. What would that look like? I’m envisioning a workshop which is even more controlled by the students/participants. It might’ve even been initialized by them. With more influence we might cross the threshold to the SI-quadrant (Student-driven / Involving) and at the same time increase the amount of involvement felt by the participants. If we imagine the opposite for our workshop activity. The instructor/manager takes control over what’s being discussed and the participants feels like they’re being told what to think/say/do. 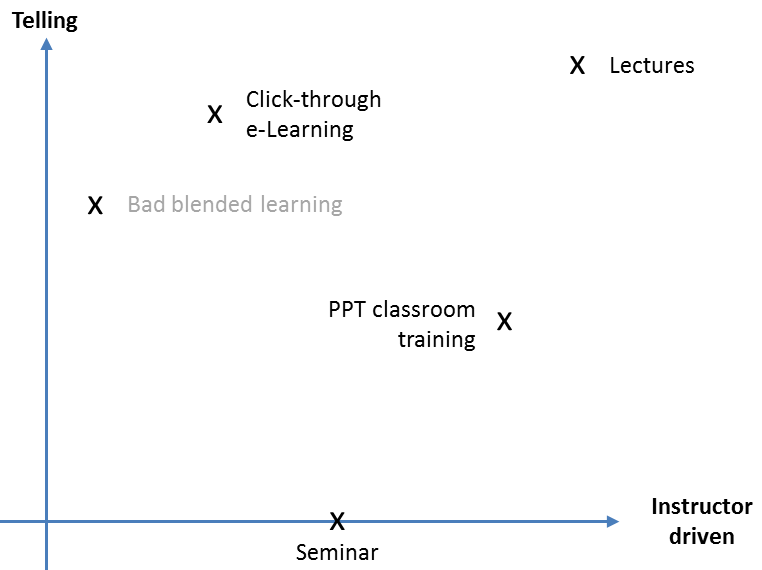 In the picture below I didn’t let the red line cross into the IT-quadrant (Instructor-driven / Telling) since if it was to go that far it wouldn’t even be a workshop anymore, would it? Annoyed with my own post – why this focus on training? 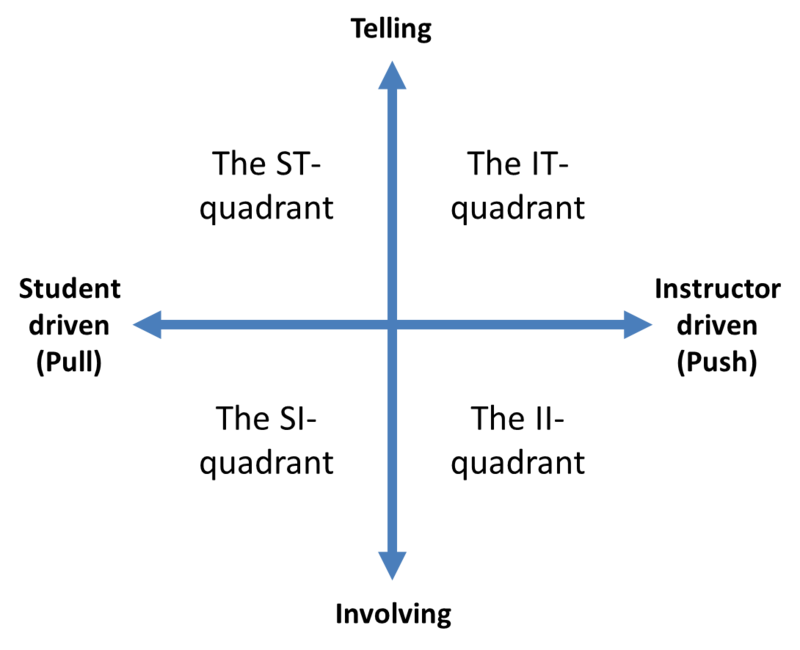 Yesterday I posted the second post in the TIIS-Matrix series – my own model where you place activities in four different quadrants based on if their focus is Telling or Involving as well as if they’re Instructor-driven or Student-driven. What I’m annoyed about is that I actually fell in the common learning is training is teaching trap. I even did this in the title itself! “Placing Training activities in the TIIS-Matrix”. Jeez! I’m somewhat of a missionary at work always stating they obvious that teaching ≠ training ≠ learning. You don’t have to train people for them to learn and teaching is absolutely not the only way to train someone! I know this but I fell in the same trap as most people do. It’s a fallacy of simplicity in a way since people have just gotten used to the idea of always having someone telling them what to do in school and not thinking about all those times where you actually learned something by yourself. Did you use a PowerPoint presentation the last time you really learned something? Why should you read from a PPT all the while you are standing in front of a room full of people trying to teach them this same thing then? Let’s take the quadrants one by one and see what training activities we could fit into them. And I am aware that this is an approximation and that someone else might say “I wouldn’t place Lectures there!” or “When I’m doing workshops they sure are…” etc. This is my personal view of things and if nothing else, the TIIS-Matrix could be used as a discussion exercise as to how your team looks at things. In the illustrations below I’ve put the activities as I view them being performed most commonly. In all of the quadrant’s I’ve got suggestions of a corner activity. This doesn’t mean that it’s particularly good or bad. Only that I’ve located it at the extreme position the furthest away from the matrix’s center. Also, some of the activities are displayed with grey text, which is to symbolize that they’re in fact not one activity but more a blend of many others, but their design make them reside in one particular quadrant. Get rid of the Telling – Start Involving! Do you recognize this old Chinese proverb? I think this could symbolize three different levels of training and learning. The first line here is a classic boring lecture, powerpoint or click-through e-learning. This is all strictly Telling the learner what’s right and what’s wrong. The second line is a bit better since we get a context with real-life examples and similar. The third line is what we always should aim at. That the learner is Involved and thereby uses what is learned in the course/conversation/book etc. I see Telling and Involving as two opposites when you look at a training. Either someone or something is leaving you out of affecting what’s being taught or they/it invite you in or maybe leaves you in charge of it. This is where the TIIS-Matrix comes in! I attended a webinar with Tim Hagen from Sales Progress and Training Reinforcement Partners on the subject of why coaching is such a powerful tool to get your employees really change and meet results. Why? Because coaching in principle means asking questions that starts the inner dialogue. By making people trying to answer questions themselves, instead of telling them what to do, it really takes hold much more. One is more prone to do as one self suggests than if it comes from the outside – often just leading to a defensive stance where people actually tries to disprove whatever the suggestion was. In the continuing venture to share my findings in the treasure trove that is the internet, I’ve today come to the Cynefin Framework. Cynefin isn’t an abbreviation but a Welsh word meaning “habitat” or “place”, signifies the multiple factors in our environment and our experience that influence us in ways we can never understand. Its creator, Dave Snowden, explains and introduces the Cynefin Framework in the following video with a brief explanation of its origin and evolution and a detailed discussion of its architecture and function. Details of Dave’s regular one-day seminars entitled “The Cynefin Seminar” can be found here http://cognitive-edge.com/cynefin-seminar.php . Any thoughts on the implications of this model? I’ve got some of course but I’ll save that for a later post. Sir Ken Robinson – a friend of yours? If you don’t know who sir Ken Robinson is, you’re in for a treat! He’s a creativity expert that has made such an impact on education that he has been knighted for his servies. He has written many books on the subject of transforming education and has given several lauded speaches at TED. I’ve embedded his most popular speach below and, just to point out, as of today it’s the most viewed TED talk ever with over 12 milion views as of today. If you enjoyed this clip you should definitively check out his website (http://www.sirkenrobinson.com/) and, of course, just google “sir ken robinson” to find all other great presentations and speaches he’s held over the years. Greatly inspiring and hilariously funny at the same time. Can’t beat that!